Blood vessels are flexible tubes that carry blood, associated oxygen, nutrients, water, and hormones throughout the body. Blood vessels consist of arteries, arterioles, capillaries, venules, and veins. Vessel networks deliver blood to all tissues in a directed and regulated manner. Arteries and veins are composed of three tissue layers. The thick outermost layer of a vessel (tunica adventitia or tunica externa ) is made of connective tissue. The middle layer ( tunica media ) is thicker and contains more contractile tissue in arteries than in veins. It consists of circularly arranged elastic fibers, connective tissue, and smooth muscle cells. The inner layer ( tunica intima ) is the thinnest layer, comprised of a single layer of endothelium supported by a subendothelial layer. Capillaries consist of a single layer of endothelium and associated connective tissue. tunica intima: The innermost layer of a blood vessel. tunica externa: The outermost layer of a blood vessel. tunica media: The middle layer of a blood vessel. anastomosis: The junction between blood vessels. Blood vessels are key components of the systemic and pulmonary circulatory systems that distribute blood throughout the body. There are three major types of blood vessels: arteries that carry blood away from the heart, branching into smaller arterioles throughout the body and eventually forming the capillary network. The latter facilitates efficient chemical exchange between tissue and blood. Capillaries in turn merge into venules, then into larger veins responsible for returning the blood to the heart. The junctions between vessels are called anastomoses. Arteries and veins are comprised of three distinct layers while the much smaller capillaries are composed of a single layer. The inner layer (tunica intima) is the thinnest layer, formed from a single continuous layer of endothelial cells and supported by a subendothelial layer of connective tissue and supportive cells. In smaller arterioles or venules, this subendothelial layer consists of a single layer of cells, but can be much thicker in larger vessels such as the aorta. The tunica intima is surrounded by a thin membrane comprised of elastic fibers running parallel to the vessel. Capillaries consist only of the thin endothelial layer of cells with an associated thin layer of connective tissue. Surrounding the tunica intima is the tunica media, comprised of smooth muscle cells and elastic and connective tissues arranged circularly around the vessel. This layer is much thicker in arteries than in veins. Fiber composition also differs; veins contain fewer elastic fibers and function to control caliber of the arteries, a key step in maintaining blood pressure. The outermost layer is the tunica externa or tunica adventitia, composed entirely of connective fibers and surrounded by an external elastic lamina which functions to anchor vessels with surrounding tissues. The tunica externa is often thicker in veins to prevent collapse of the blood vessel and provide protection from damage since veins may be superficially located. 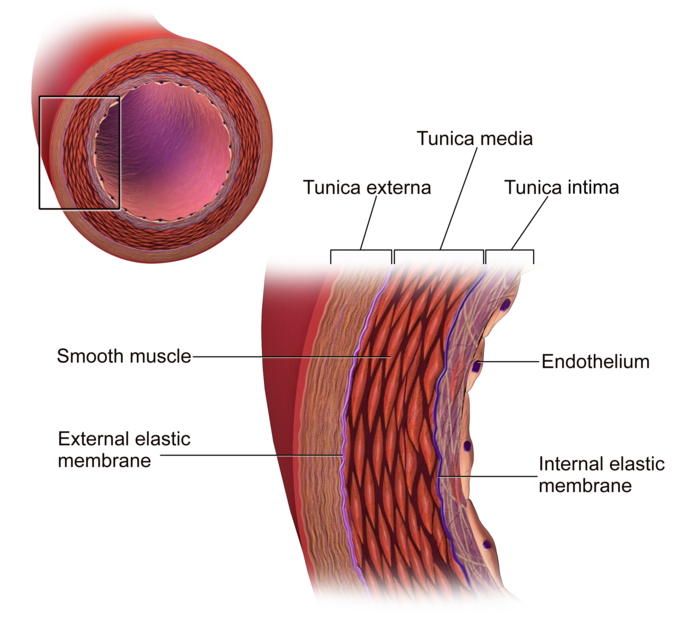 Structure of the Artery Wall: This diagram of the artery wall indicates the smooth muscle, external elastic membrane, endothelium, internal elastic membrane, tunica externa, tunica media, and tunica intima. A major structural difference between arteries and veins is the presence of valves. In arteries, the blood is pumped under pressure from the heart, so backflow cannot occur. However, passing through the capillary network results in a decrease in blood pressure, meaning that backflow of blood is possible in veins. To counteract this, veins contain numerous one-direction valves that prevent backflow. Blood vessels carry nutrients and oxygen throughout the body and aid in gas exchange. Systemic and pulmonary circulatory systems efficiently deliver oxygen to the tissues of the body and remove waste products such as carbon dioxide. Arterial blood (except in the pulmonary artery ) is highly saturated with oxygen and supplies oxygen to the body’s tissues. Venous blood (except in the pulmonary vein ) is deoxygenated and returns to the heart to be pumped into the lungs for reoxygenation. Nutrients carried in the blood are released to tissues via the permeable endothelium of blood vessels. Immune cells move throughout the circulatory system and are able to rapidly permeate the walls of blood vessels to attend sites of injury or infection. Blood vessels can increase or decrease blood flow near the surface of the body, either increasing or reducing the amount of heat lost as a means of regulating body temperature. Blood plays many critical roles within the body: delivering nutrients and chemicals to tissues, removing waste products, and maintaining homeostasis and health. The circulatory system is transports blood through the body to perform these actions, facilitated by the extensive network of blood vessels. The circulatory system can be split into two sections, systemic and pulmonary. In the systemic circulatory system, highly oxygenated blood (95-100%) is pumped from the left ventricle of the heart and into the arteries of the body. Upon reaching the capillary networks, gas exchange between tissue and blood can occur, facilitated by the narrow walls of the capillaries. Oxygen is released from the blood into the tissues and carbon dioxide, a waste product of respiration, is absorbed. The capillaries merge into venules and then veins, carrying the deoxygenated blood (~75%) back to the right atrium of the heart at the end of the systemic circulatory system. The much smaller pulmonary system reoxygenates the blood and facilitates the removal of carbon dioxide. After leaving the heart through the right ventricle, the blood passes through the pulmonary artery, the only artery in the body that contains deoxygenated blood, and into the capillary network within the lungs. The close association of the thin-walled alveolae with the equally thin-walled capillaries allows for rapid release of carbon dioxide and uptake of oxygen. After leaving the lungs through the pulmonary vein, the only vein which carries oxygenated blood, the blood enters the left atrium. This completes the pulmonary circulatory system. The Circulatory System: This simplified diagram of the human circulatory system (anterior view) shows arteries in red and veins in blue. Blood vessels also facilitate the rapid distribution and efficient transport of factors such as glucose, amino acids, or lipids into the tissues and the removal of waste products for processing elsewhere, such as lactic acid to the liver or urea to the kidneys. Additionally, blood vessels provide the ideal network for immune system surveillance and distribution. Numerous white blood cells circulate around the body, sensing for infection or injury. Once an injury is detected, they rapidly leave the circulatory system by passing through gaps in vessel walls to reach the affected area while signalling for a larger targeted immune response. Mechanically the blood vessels, especially those near the skin, play a key role in thermoregulation. Blood vessels can swell to allow greater blood flow, allowing for greater radiant heat loss. Conversely, blood flow through these vessels can be lessened to reduce heat loss in colder climates.